It's good to be back! New Orleans was wonderful and I'm sure I'll be sharing plenty over the next few weeks, but for now here's a few iPhone teasers. We stayed in the French Quarter, and I swear I could have shot every door and balcony there. So much color and character in every one. Out of curiosity, I looked up some rent/sell prices for the houses in the French Quarter (where some of the windows are seriously bigger than our entire kitchen), and of course it's practically cheaper than a closet in NYC. Ah, that's the way the cookie crumbles. 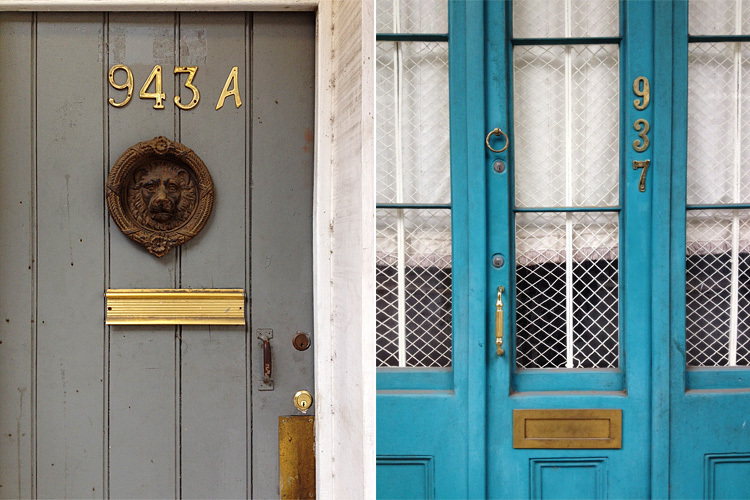 Oooh, these doors really are full of color and character! Can't wait to see the rest of your photos from New Orleans! So funny.... I cannot tell you how many photos I have taken of doors. There is such character to be found - almost like people's faces. Beautiful shots. I'm looking forward to more! I love the architecture in New Orleans. I remember the windows and doors being so cool looking over there. Bring on the rest of the shots! i also love looking/taking photos of the doors when i travel. lovely photos! awesome. We spent a week in NOLA in 2010. 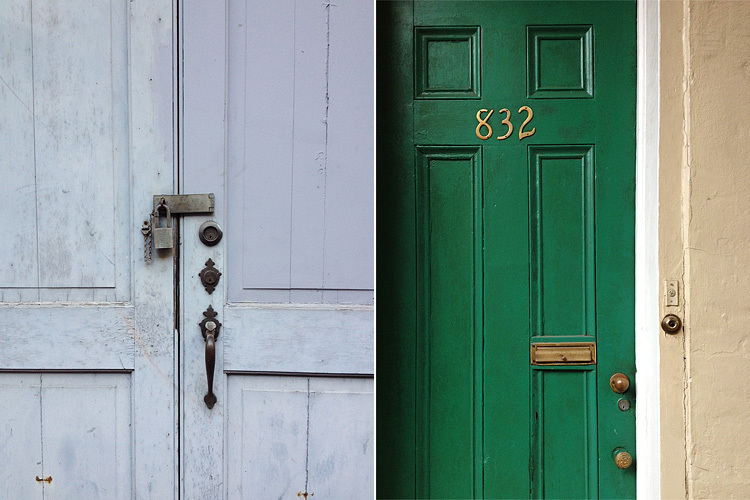 I wasn't as obsessed with photographing doors then and I can tell by your pictures, what amazing opportunities I missed! But, I still look back on my pictures and relish the sweet memories and celebrate the growth of my photography over time. Can't wait to see more from you! Pretty crazy that these are iPhone pictures. the french quarter is so photogenic. looking forward to seeing more from your trip! woot! welcome back, and i can't wait to see your pics! "Pretty crazy that these are iPhone pictures." the iPhone in natural light is a gem. I'd never even dare underestimate the quality of phone cameras that are being put out. You're like me. 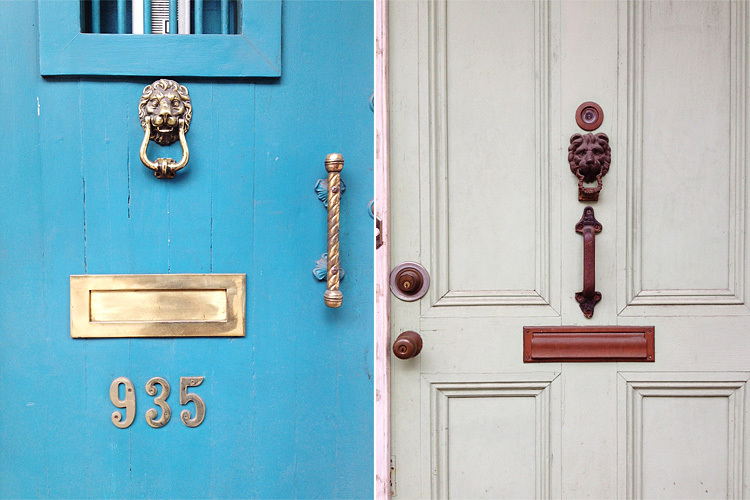 Everywhere I go, I'm drawn to colorful doors, door knockers and door knobs. I'm obsessed with doors! Can't wait to see more photos from your New Orleans trip. I too would go crazy photographing these colorful doors!! Mmmm.., maybe you should move to New Orleans - such a bargain :) I know I can never leave LA. I'm spoiled by the weather here.